I have a bit of a thing for shoes and now I have started to love shoes for the Little Lady as well. I feel that this is just a natural progression ha! Out for lunch – and over friendly people. A couple of Fridays ago and after a couple of hours looking at nurseries for the Little Lady we decided that we should do the sensible thing and get a bite to eat, as you do. As it was so quiet Mr K. decided to take the Little Lady over to the open kitchen so that she could be nosey, which she loved and the chef seemed to take a shine to her. The next thing we know the chef is making his way over and handing the Little Lady a prawn cracker – people offering her food without checking with me first is a bit of a bug bear of mine, but as it wasn’t a big lump of cake we politely thanked him and let her nibble away. The chef happy that the Little Lady was happy walked back to the kitchen and left us to our lunch. 1. I’m incredibly British and stupidly worry that I would have offended the chef. 2. More importantly the Little Lady was happy and we were watching the whole time. 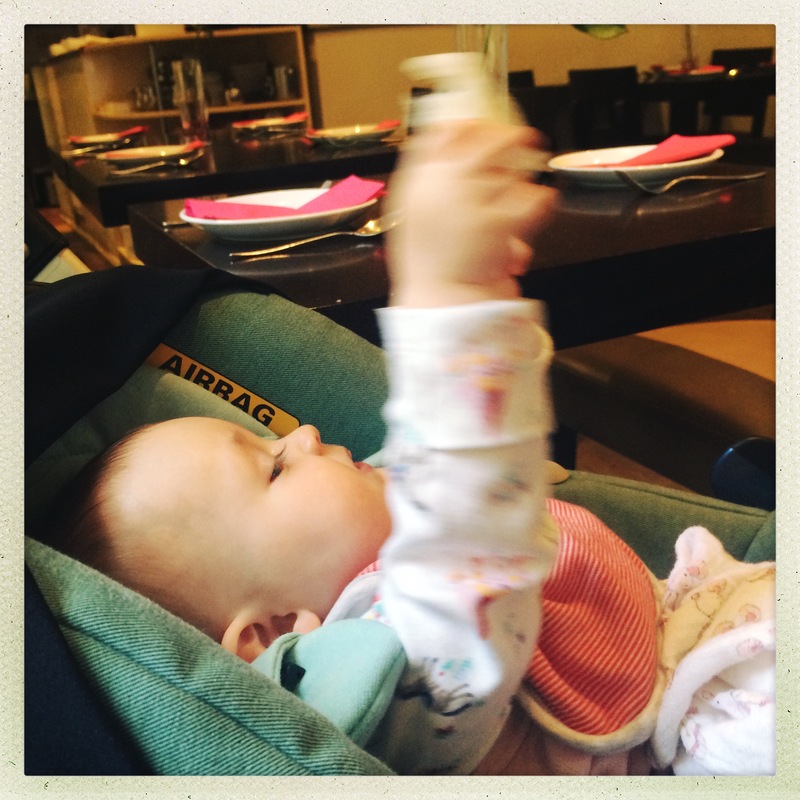 So that day the Little Lady had a number of firsts, she saw a couple of different nurseries (a first for us aswell), she tried a prawn cracker and tempura veg and she was held by a complete stranger. We have been really lucky the past few days and have had amazing weather, this is unusual as we’ve had a bank holiday and it’s half term and generally the sun never shines for these two events. Every year Mr K. and I try to do something nice to celebrate our wedding anniversary and we wanted this year to be no different. As our wedding anniversary is today, we decided that a weekend treat would be the best option. So we picked a hotel that we know and love and booked ourselves in.